MAX is on track to resume regular service Sunday morning, May 22, following the 1st Avenue MAX Improvements project that rejuvenated a section of the original MAX alignment. Crews took a test train through the new sections of rail and switches on Friday afternoon. 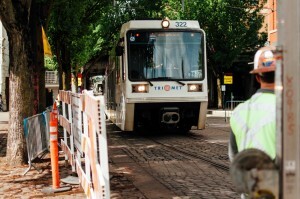 The test went well and after crews finish some track work on Saturday, MAX Blue and Red lines are expected to return to their regular route in Downtown Portland at the start of service Sunday morning. See video of the test train going through the new switch section under the Morrison Bridge and the along the new curved rail near Skidmore Fountain. 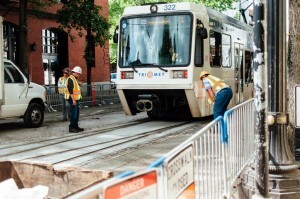 TriMet thanks riders for their patience and understanding during the two-week project. TriMet customer service, volunteer Ride Guides and other staff spent more than 2,000 hours at MAX platforms helping riders navigate the disruption and schedule changes. Special signs and pavement stickers helped direct people where they needed to go. Operators made special announcements. And staff, both in the field and at TriMet facilities, played vital roles to help our customers during this time. Many riders expressed appreciation for the extra support and guidance. We also heard from riders who altered their trips, planned extra time or adjusted their travel modes during the project. The 1st Avenue MAX Improvements project was the biggest rail replacement project in MAX history and will increase reliability and make for a smoother, better ride along 1st Avenue. The area is part of the original MAX alignment that opened Sept. 5, 1986. During the project, crews replaced switches (sections of track that allow trains to move from one set of tracks to another) on 1st Avenue near SW Morrison and near NW Couch. They pulled out old wooden ties and other materials and replaced them with more robust, longer-lasting materials. They also replaced curved rail in the eastbound track way near the Skidmore Fountain. To maximize the time MAX service had to be shut down along 1st Avenue, crews also cleaned out track drains and improved drainage under the Morrison Bridge. They replaced some hardware on the overhead wire system, upgraded a substation, replaced platform tiles and other such work. All of this makes for a smoother, quieter ride, improved reliability and better MAX service. The improvements at NW 1st and Couch also benefit pedestrians, cyclists and motorists. Crews fixed broken pavement, cobblestones and bricks there. 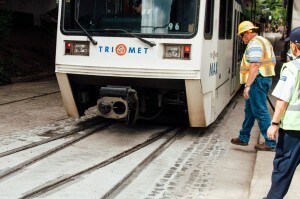 The more durable materials eliminate asphalt breakage next to the tracks in the future. After serving riders for 30 years, there are more upgrades and replacements on the MAX system that must be done. Beginning Aug. 21 through Sept. 3, crews will tackle the next major project, this one in the Rose Quarter Transit Center area. Crews will replace switches as well as realign the track just east of the transit center. Those improvements will require moving poles that hold up the overhead power wire and replacing the signal system, among other work. As with the 1st Avenue MAX Improvements, MAX service will need to be adjusted during this project. TriMet will provide riders with advance notice of the service changes in the weeks ahead of the project.